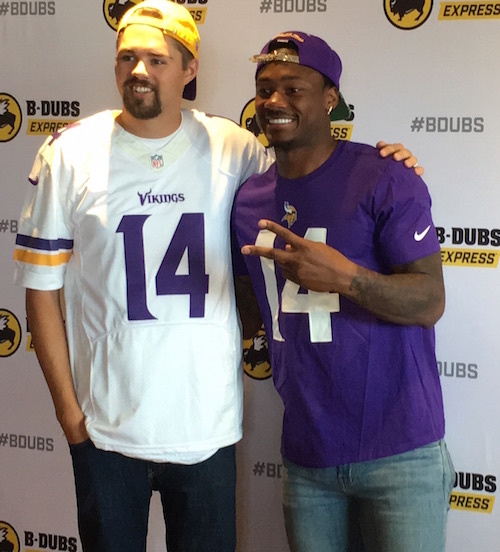 Here is an iFolloSports.com original photo and piece of video showcasing Vikings wide receiver Stefon Diggs taking pictures with fans and signing some autographs, Tuesday, during an appearance at a brand new Buffalo Wild Wings – B-Dubs Express location, in the Twin Cities suburb of Edina, Minnesota. Diggs also served wings to customers at the counter. The Vikings are in the middle of their 2017 training camp, with the appearance occurring on one of the team’s off days. The University of Maryland alum is entering his third NFL season. Diggs' speed and ability to go over the middle has made him a key contributor to the Vikings. After two campaigns, Diggs has totaled 136 catches and 7 touchdowns. The now 23-year-old Washington, D.C. area product has been frequently chronicled on iFolloSports.com. Here is Diggs signing autographs in Minnesota, during his rookie season of 2015. This clip showcases Diggs appearing and signing autographs, this past offseason, at an event coinciding with the EA Sports Madden '17 Vikings Championship Challenger tournament, held at the Mall of America rotunda, in Bloomington, Minnesota.